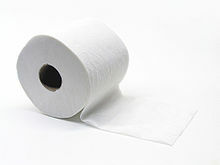 Toilet paper is soft paper, used to wipe urine or feces after using the toilet. It is usually sold in white rolls, made up of square sheets. Modern toilet paper is very absorbent and is designed to break up in the sewage system. The paper is often available in different textures and colours. In former times people had no toilet paper and used other things. The Greeks, for example, used stones or human hair, Germans used leaves and straw. Some people used maize leaves. Some used sand instead of toilet paper. In the Middle Ages people used moss and the rich ones preferred sheep wool. The first toilet paper was produced in China in the 14th century. In 1857 Joseph Gayetty produced toilet paper in cartons in the USA. The first rolls of toilet paper were produced in 1890 in Great Britain. In many parts of the world, newspaper is used instead of toilet paper. This page was last changed on 13 August 2018, at 11:21.